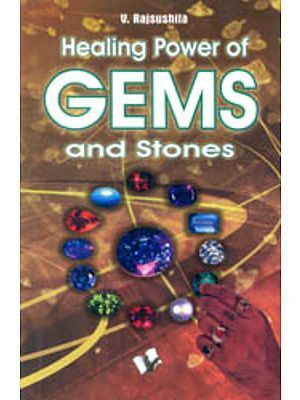 This complete introduction to the healing properties of crystals and gemstones is based on insights gained through years of experience by the author. 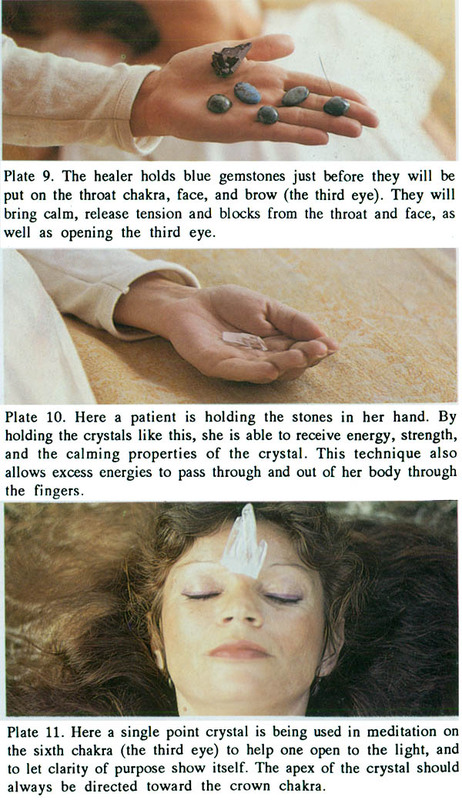 She is one of the very few individuals practicing what the ancients knew: that crystals and gemstones have the capacity to aid in our spiritual transformation, and to heal us. 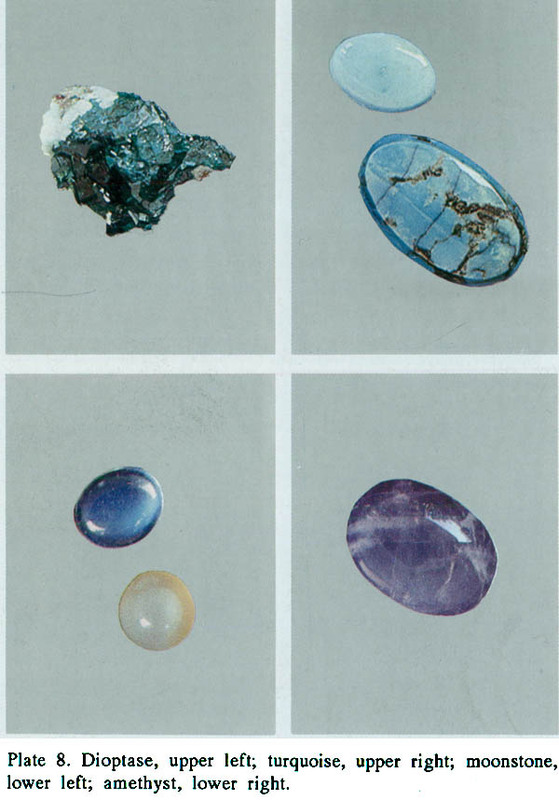  Gems and crystals as manifestations of light and colour. 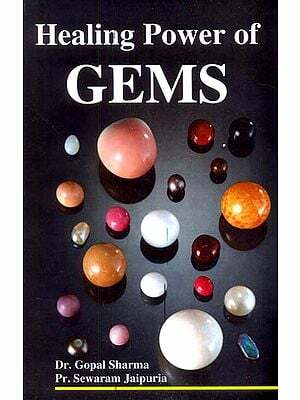  The zodiacal rulers of gems. 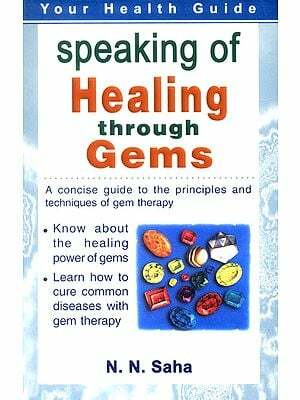  The healing magic of gems. 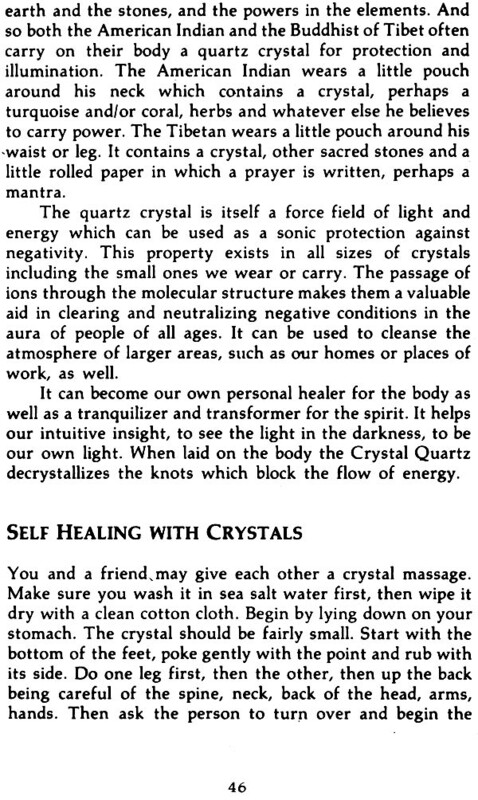  How to choose, clean and prepare crystals and gem stones for healing work. 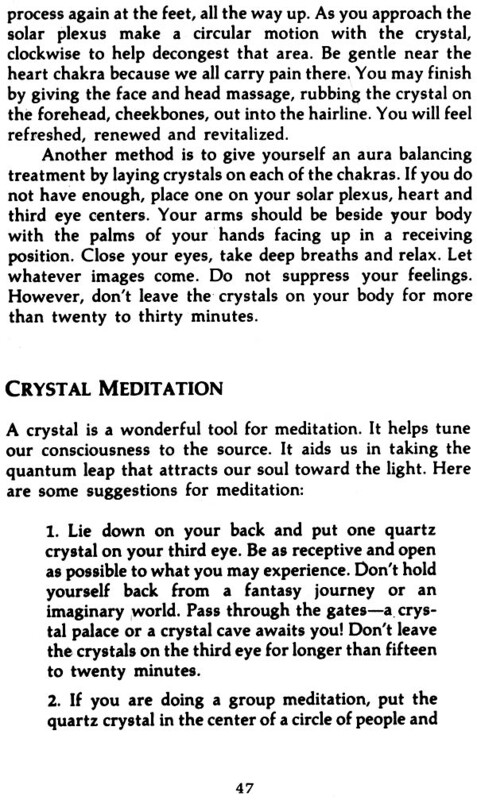 Also included are specific guidelines for healing work, plus breathing and meditations techniques used in healing with gems and crystals. Daya Sarai Chocran regards India as her spiritual home and likes to spend most of her time in Kerala when she is not traveling. Her other home is in France. The book has already been published in the US, Germany and France. This is the first Indian edition. I stand full of awe and wonder when I consider the beauty and abundance of our Mother Earth. It is through this love that we meet at this time. Many years ago, after living on an island, I came back to the United States and started to learn about holistic health. At the time I also become interested in the American Indian way, for it seemed to be in tune with mother earth, the elements, the sacred. I spent several years in the Southwest-Colorado, New Mexico, and Arizona-learning new ways of healing, which were actually ancient ways, and eventually experienced a spiritual reawakening. Several teachers came: in Arizona, after spending a lot of time visiting and living on Indian reservations, I moved to the mountains. I would take long walks, feeling the power of the stones and rocks there. I believed that the rocks were guardians with many messages for me, if I could but hear them. While there, I met a man, a lapidary, who was also very influenced by the sacredness of the Indian way. 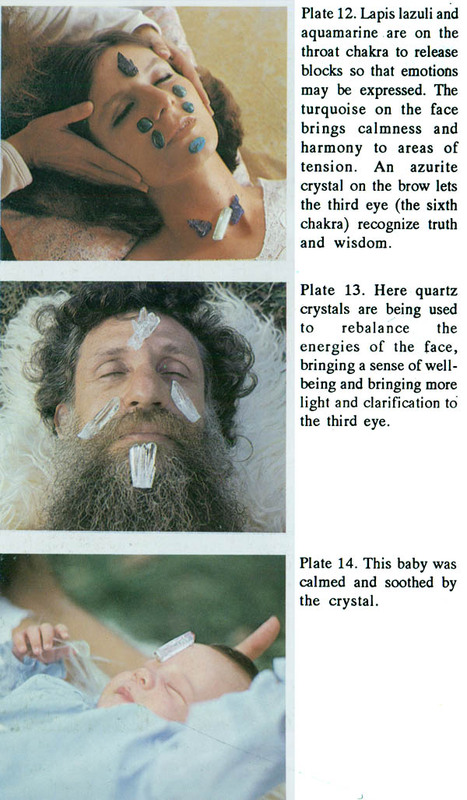 He was deep in communion with the crystals and stones. He shared much of the knowledge he channeled about their unique properties with me. Once he organized a meditation I a mine-deep in the earth. That experience changed my life. I truly the incredible power of the earth in that mine. We limbed down on rope ladders, lit candles, and in the dark deep earth, we chanted, prayed, thanked, and became one. He gave me the crystal that is now my faithful companion, going with me to workshops and healing sessions, and everywhere I travel. A spark had been lit within me, and I went on to learn more with the Indian medicine women. 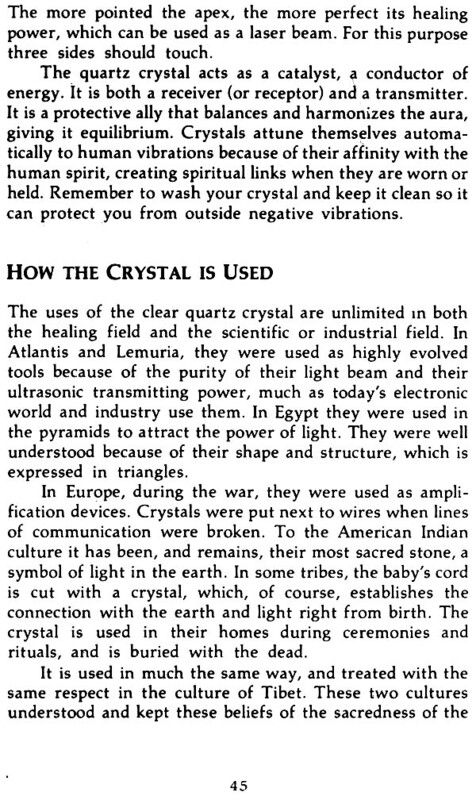 They spoke of our connection with the animal, plant, and mineral kingdoms, of our union with the elements, of rituals and ceremonies with crystals and stones. They told of the stones' healing and spiritual qualities, of a way of living in harmony with the cosmos. They talked of the power and strength that is given to us from the mountains, the sea, the sun, the moon, the wind, the rain, the trees. One shamaness explained the importance of walking softly upon the earth so as not to disturb other kingdoms. Another spoke about the centering of the self through drumming, of the chant for song) each one of us has been born to sing  and how we should find that song inside and give it to the world. I respect these teachings, and have tried to apply them in my daily life, and also want to pass them on. Later I met a woman-a healer who was deeply involved with East Indian ways. An ancient sister had reappeared, and with her much exploration and experimentation happened. I learned about body massage, yogic meditation, the healing essence of flowers. We went into the desert to pick wild flowers to take home to make our own remedies. I became fascinated with the magical qualities of color. It is in flowers and stones that color is most perfectly manifested. They are soulmates to each other. I began working with color therapy, using visualization, meditation, and color candles. While working in a drug rehabilitation center-one that believed in using food as medicine and yoga to create changes in consciousness-I witnessed the powerful effects of these methods. This, too, I incur-ported in my life. This remarkable woman, through her help and guidance, taught me counseling and demonstrated the art of selfless giving. This mandala of various healing methods and various forms of training finally focused itself on healing with crystals and stone. Form is important to me, and a realization came that the crystals and stones, which are manifested forms of light and color, were to become my work, my purpose, my joy. I can touch and feel this earthly material filled with the spirit of light. The beauty of the stones touches my heart and nourishes my soul. Love, which is an opening of the hart, is an act of faith-faith in potentiality. Loving requires courage, the ability to take a risk, the readiness to even accept pain and disappointment, and the willingness to grow. It is toward the goal of higher understanding and the opening of the hearts of humanity that my work is dedicated. It takes time to learn to work with the crystals and stones. 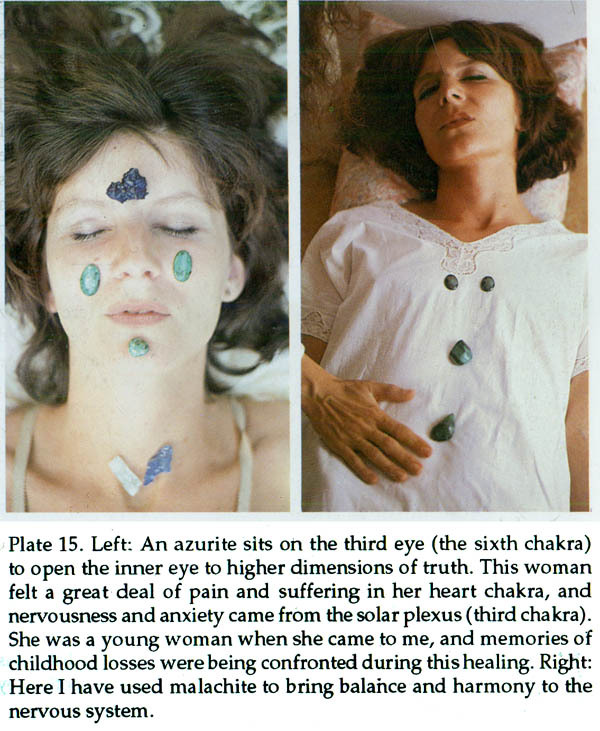 Although I studied many other facets of the healing experience, I prefer working with the stones. However, my other experience comes into play when I work with the stones, and suggested that readers learn as much as they can in addition to the work with the stones. 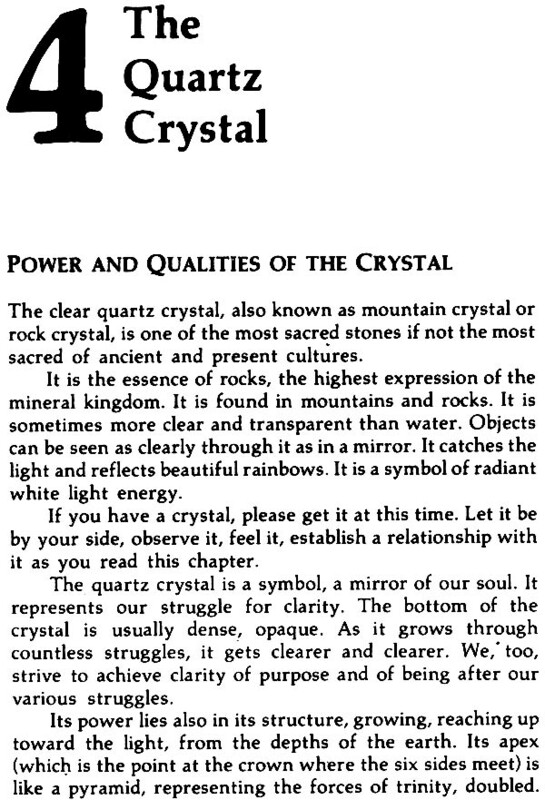 Much of my knowledge of the crystals and stones comes from an intuitional level, as many years of practice lets the stones "talk" to you. The stones pick me. They speak and I listen. This can only happen when you let yourself believe in the higher forces. When working with the stones, I follow the laws of the charkas (which will be discussed in Chapters 6 and 7) and you can use this information as a guide until you develop your own way. There are certain basic laws in the universe that are to be utilized, recognized and respected. Don't discard them-work with them lovingly! Also keep in mind that you become a channel for the stones when you work with them. You do not heal-the spirit in the stones heals and the people you work with in the healing process actually heal themselves. Each person you work with is responsible for himself or herself; you can never become responsible for anyone but yourself. However, keep in mind that you should work with the stones in a responsible way. I travel a great deal doing lectures, workshops and attending to a private treatment practice. The powerful effects and reactions that I have witnessed over the years reinforce my trust and confidence in the stones. I feel blessed in having been given this mission, and I hope this book will open a beautiful new world for you! A Tibetan Buddhist proverb states, "If, after having been born a human being, One gives no heed to the Holy Doctrine. One resembleth a man who returneth empty-handed from a land rich in precious gems; and that is a grievous failure." 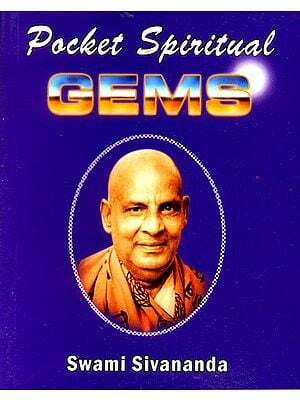 This book came from a need to unburden myself, to reveal, and most of all, to perpetuate, this ancient tradition of healing and transformation through the aid of the stones-an organic way-from the earth. I bought this book from you and I love it. It is really interesting and helpful in matters of natural stones and their uses. Thank you. It´s been of great help. I am interested to review this book. I want more information on the art.